Mixologist extraordinaire Bob Peters posted my article about his Punch Room on his personal website. Thanks, Bob- hope to see you again soon! I always wanted to be a solo musician. I also always wanted to play in a band. I’m fully aware of the contradiction involved. I liked solo because I’m a control freak; I wanted to play the music I wanted, to practice when it was convenient, to make all the mistakes, and claim all the glory. And the tips. On the other hand, I much preferred the sounds of jazz, rock, and blues ensembles, as well as the ability to stretch out and improvise: in other words, I wanted to be in a group. I settled for a long while playing solo acoustic guitar (hard for me to improvise in that form) and participate in monthly blues jams (infrequent, and the luck of the draw as far as your fellow musicians went). They were both fun, but neither was ideal. Then came looping. While the Gibson Echoplex and Boomerang loopers had been around, it was the Boss RC series that gave me my start. Beginning with the small RC-2, I suddenly had a tool to practice, jam, and, yes, perform with. It was best suited for open mic nights where I could plug in my magic box between my acoustic guitar and amp, riffing over chord progressions. It didn’t make for gripping rock and roll fireworks, but it was fun, and good rhythm and improv training. Eventually I wanted more, and looked into other options. I wanted to expand the sound I could make as a solo player. I was on the verge of buying a foot drum kit (apologies to Shakey Graves, but- shudder), when I started reading about the Digitech Trio. The Trio uses a version of Band in a Box software to generate bass and drum parts based on your guitar input. You select your genre (from Alt-Rock to Jazz), hit the footswitch, and begin playing. You soon learn that the simplest one strum per beat patterns read best (unfortunately, precisely the ones that are the least interesting to the audience). There was also no capacity to store songs once they were tweaked to your liking, so live performance meant creating your pattern before each song. Digitech marketed the Trio as a practice tool, and although I (and doubtless hundreds of others) used it in live performance, it was not a true performance tool. Digitech, though, was continuing to work on the concept, and soon issued the TRIO+. The new pedal inc orporates a synchronized looper with the band creator software, adds several genres (such as Latin Jazz, Folk, and others), and, arguably most importantly, added the ability to store songs- twelve per micro-SD card. This is the platform that has allowed me to put together a full solo gig rig. I play electric guitar instrumentals: “Sleepwalk,” “007 Theme,” “Tequila,” “Gravity” (well, it’s an instrumental when I play it). While running straight into an amp with the TRIO+ is possible, it produces less than full-range sound, as well as taking on any characteristics inherent (or dialed in) to the amp- gain, reverb, midrange spike/scoop, etc. This doesn’t make for a great-sounding gig rig, so once I started gigging the TRIO and TRIO+, I put together a one-trip rig that can conquer any winery, farmer’s market, or coffeehouse with ease. reliable. Here’s what I came up with: guitar to TRIO+ (which is controlled by a Digitech FS3X footswitch). The drum/bass out goes into a Behringer mini-mixer (I connect it TRS instead of mono- it can work either way, but the TRS connect yields less noise). The guitar out goes into a Polytune tuner, a Keeley Memphis Sun slapback/reverb, a Joyo American Sound amp sim, and into the mixer. The summed mixer output (TRS) then goes to directly to the balanced input on the mighty Bose L1 compact. So the pedal board (made by Blackbird) ends up being supremely simple: one power cord in, one guitar cord in, and one TRS-to-balanced cord out. This is by no means the only way to hook up a TRIO+ system. I started by running the guitar into a guitar amp, and the bass/drums into a mini PA. I later moved to the amp sim pedal and a Roland Cube Street EX. My current rig, though, sounds the best, and it’s the easiest to deal with. It’s light, and set up is just stacking the tweeter tower on the Bose and plugging in two power cords and two sound cables. I can easily cover a crowd of 150, indoors or out. I mentioned earlier that the ability to save songs was, for me, the most significant step up from the TRIO to the TRIO+. I currently have two micro-SD cards with twelve songs each that can cover a two-hour gig. I found a slim micro-SD card holder that I have Velcroed to the pedal board so I can swap cards (an admittedly finicky process made more challenging by a dark stage). I also Velcro a laminated song list to the board, as the TRIO+ gives no readout of what song the pedal is on beyond 1-12. If you can’t remember that song 4 on card 2 is “The Girl from Ipanema” then you’ll need a similar list. The other must-have for gigging with the TRIO+ is the FS3X footswitch. It has several possible control configurations, but the main thing I use it for is to switch between song sections during performance (otherwise you have to push a tiny button on the pedal itself). If you’re like me and like to elevate your board so you can adjust levels on the fly, you can use a longer TRS cord to have the FS3X on the floor. I may be a Pollyanna, but I don’t expect pedals to replace drummers and bassists completely. I know I’d rather be playing with live musicians than a pedal. But the reality of geography, day jobs, family obligations, and musical taste make the TRIO+ and other stompbox accompanists a great alternative for musicians of all sorts. Made by Mrs. G&G. I got the Daddy’s Day Double. 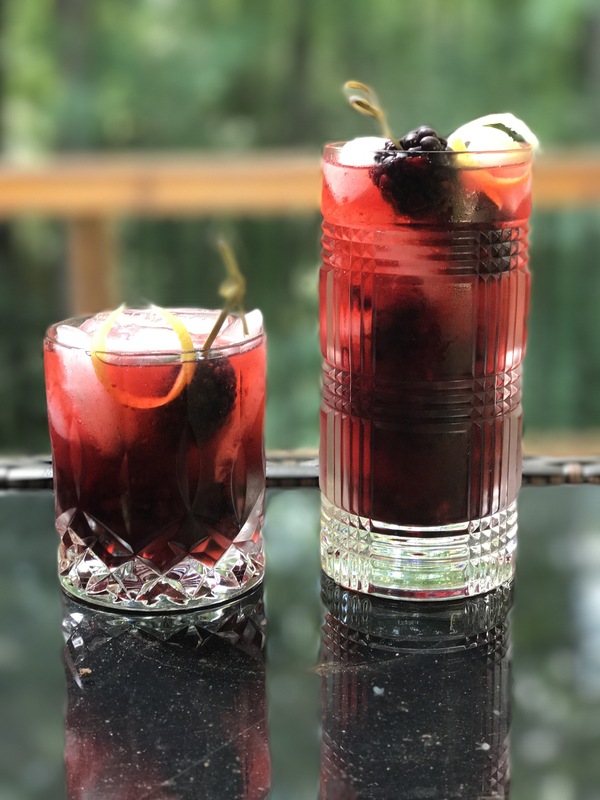 .75 lemon juice, 1.5 gin, .5 creme de cassis, .5 simple syrup, 6 blackberries muddled with the lemon and simple syrup, stirred. Garnish with blackberries and lemon twist. Bob Peters is not messing around. From his lair on the fifteenth floor of the Ritz Carlton in Charlotte, he is crafting cocktails. I normally stay away from the word “craft” these days, because it evokes artisanal micro-green salads and small batch kale tallow soap. Peters is a craftsman, though, and Mrs. Guitars and Gin and I headed up the big elevator one windy March evening to see the man in action and taste his wares. Things kicked off in a distinctly 007 mood. A R-C staff member showed us through the lobby bar (itself lively and hip enough to be a happy destination) to the elevator. Upon emerging at floor fifteen, we were faced with a plain corridor ending in a hostess stand and what looked to be a black leather covered wall. The Punch Room only has thirty-seven seats, and while there is, apparently, often a queue in the corridor, we were, as always, unfashionably early and walked right up. The hostess slipped a key-card into a slot in the leather wall and then opened a leather door (it’s possible these were not real leather- they could be vegan for all I know). This led to an ante chamber featuring a single leather-doored restroom. From there. . . the Punch Room itself beckoned. The first thing that happens when you enter the Punch Room is that someone hands you a glass of punch. Peters makes up a big bowl every night of a different variety. Historically, punches are older than cocktails, and the one we had was delightful (and strong) indeed. I wish I could tell you what was in it, but I’m not even sure we found out. He does have several punches on the menu (made in batches for two); for example, the one called “A Rad Miracle” features Milagro Reposado tequila, salted radish syrup, and Lillet Blanc. From there, we put ourselves in Peters’ hands. I first went to the bar to seek his advice, and he walked back to our table to ask about our preferences and favorites. He and Mrs. G&G had a deep conversation about flavor profiles and botanicals. I gave him the directive to treat me like a sorority sister on spring break who’d never had a drink without an umbrella. The lovely Pisco Sour, featuring pisco, muddled lemon and lime, and St. Germain foam on top. Pisco is a light amber Peruvian brandy, but unlike the heavily flavored European brandies most of us know, it is unlawful to age pisco in any sort of wood at all. The result is a lighter, grapey-er spirit. For me, the offering was a carbonated Aviation. I hadn’t told Bob about my love for the barely-violet gin cocktail, but in his wisdom he had sussed it out. He uses Cardinal gin, lemon juice, Luxardo, and creme de violette, as per tradition, but carbonates it himself with his personal. . . carbonator? It was wonderful, combining a fine-bubble fizz with a lovely light drink. Then we moved up to the bar, wanting to continue our impromptu education uninterrupted. He let us taste the difference between green and yellow Chartreuse, let us in on the best-kept-secret ABC store in Charlotte (Cherry Street ABC), and further prodded our palates. When I confessed that I had no love for the über-hip Negroni, he took it as a challenge and prepared for me a Cynar Boulevadier, subbing cynar for campari and creating a bitter-but-slightly-less-so drink that allowed the complexity and sweetness to shine through the shadows. I haven’t discussed the luxe decor, the bar snacks, or the views of downtown Charlotte. They’re all superb, but the real draw here is Peters. The hours he mulled over glassware, his curating of small batch exotic spirits, his unrelenting search for new flavors, and his generosity of spirit as host and teacher: these are the real draw. We’ll be back; stop by and tell Bob we sent you. One of our very favorite cocktails of late has been the Last Word. Equal parts Luxardo, Chartreuse, gin, and lime juice, this refresher is citrus-forward enough to be crowd-friendly but herbally complex enough to keep the interest of the most curmudgeonly craft cocktail hipster. The two liqueurs are unique and give a “this tastes familiar but I can’t put my finger on it” mystique. Luxardo has become our secret weapon, with its funky bitter cherry pit flavor bringing the Tiki to the party. The Chartreuse is the star here, though: a liqueur made in a single French monastery since 1737. Although it contains some 130 herbs and botanicals, only two monks at any given time know the recipe. The recipe originated during the gin boom under Prohibition, and has, like the Corpse Reviver #2, had a renaissance in the past few years. It doesn’t hurt that the drink is beautiful to look at in the coupe as well. We support the local boys at Cardinal Gin in Western North Carolina, and their smooth blend of botanicals complements the Chartreuse perfectly. 1 oz. each lime juice, Chartreuse, Luxardo, and gin, shaken and strained. Gretsch is famous for its unconventional guitar shapes, and at least a few of these are owing to an unconventional player: rock and roll singer (and one of the only human beings ever to have had a beat named after him) the late Elias Otha Bates, aka Bo Diddley. Bo Diddley is a vastly important figure in the history of rock and roll. If you want to see someone well and truly in command of an audience, watch this clip of Bo in 1965. How someone who looks like Urkel’s uncle can be so dignified yet so primal is a rock and roll mystery. The rectangular guitar above was one of Bo’s own designs. He wanted a guitar shaped like the ones he had made from cigar boxes and played as a youth. Below, you see another Bo design, the Jupiter Thunderbird (which is now known as the “Billy-Bo” because of its association with Bo but also with Billy Gibbons of ZZ Top). Call it autumn of 1986. I was walking alone down a street in Copenhagen (yes, Denmark) one morning, minding my own Scandinavian business. Around the corner, about twenty feet away, a group of men emerged, laughing and American. In the center, a mountain of a man wearing a cowboy hat with a feather band was smiling broadly and telling a story. After a split second, my twenty-year-old brain fired, and without thinking I blurted out: “Bo Diddley! I love you man!” Without missing a beat or saying a word, the man shot his finger-guns at me and smiled (did he wink? ), and walked on. It remains one of the proudest moments of my life. Say you’re not a guitar player. If you’ve heard of any guitar brands before, you’ve probably heard of Gibson, Fender, and maybe Martin. A guitar you’ve definitely heard, if not heard of, is the Gretsch. The Fred Gretsch company started making musical instruments in 1883. The company started with banjos, tambourines, and drums. Guitars soon followed, and Gretsch began making big hollow-bodied jazz guitars. When rock and roll took off, Gretsch guitars were prominently featured. Bo Diddley, Eddie Cochran, and Duane Eddie all played Gretsch guitars. In the mid-1950’s, Chet Atkins became Gretsch’s most prominent endorser, and several models bearing his name were introduced. Gretsch sales, already brisk, took off when the Beatles appeared on the Ed Sullivan Show, George Harrison wielding HIS Chet Atkins signature Gretsch. George also played and recorded with a Duo-Jet model from the company. John also occasionally played a Gretsch. The 1970’s, though, weren’t particularly good to Gretsch. Aside from an occasional oddball romance (Angus Young from AC/DC, for cryin’ out loud! ), Most major acts stayed away from the big fellas. Gretsch had been bought out by Baldwin in 1967, and the quality and innovation level of the guitars plummeted. The 1980s didn’t promise much more for Gretsch. The punks and new-wavers favored Fender Jazzmasters and Mustangs, and the hair metal bands went in for pointy Charvels and Jacksons in neon colors. There just wasn’t a market for a big, elegant, glittery coffee-table of a guitar. The hippest of hepcats, and the consummate guitar player’s guitar player: Brian Setzer. Cutting through the hair metal of Def Leppard and mope-rock of The Cure came The Stray Cats, playing music that your dad is too young to remember properly. Since the rockabilly revival inspired by Setzer, Gretsch has come back in a big way, popular not only among rockabillies, but roots rockers, Americana artists, and jazz players. Check out Reverend Horton Heat, Paul Pigat, and Big Lazy for some modern Gretsch sounds. Modern Relics: Or, When is Green Blue? A couple of years ago I acquired a guitar that is a source of controversy and acrimonious debate on guitar message boards across the whole wide Internet! Is it made from baby seals? Is it studded with conflict diamonds? Does it support Obamacare? None of the above! It is a RELIC. And just what does that mean if you’re not Indiana Jones? A relic guitar is a new or nearly new guitar which has been distressed so that it looks old. Mine is a beautiful sonic blue reproduction of a circa 1960 Fender Esquire. Well, it was. Fender guitars from the 50’s and 60’s were often painted with automotive colors. Aztec Gold, Inca Silver, and Sherwood Green were straight off the GM color chart and adorned many Telecasters and Stratocasters. Sonic Blue, the color my guitar began its short life as, was a rich sky blue used on some 1956 Cadillacs. Guitars were painted with their designated colors, and then sprayed with a clear coat of nitrocellulose lacquer. Over time, the clear coat of lacquer would both yellow and check with age, UV exposure, and temperature fluctuations. The yellowed lacquer would turn Sonic Blue into a delicate crackled celadon green, as you can see on my guitar. Some of the original blue can be seen peeking through on the guitar’s edge where some of the lacquer has worn through. How is my brand-new guitar displaying yellowing and checking and other wear? The father-son team of Mark and Matt Jenny has been aging guitars for years now using a top secret set of formulae which may or may not involve UV lights, ovens, freezers, hurled sets of car keys, and dragging the guitars behind a truck. They are some of the best in the business as far as realistic aging goes and they finished the body and neck of my guitar. Brand new and very old. Why is this controversial? Well, there are very serious camps in the guitar community that believe your instrument should only carry wear and scars that it has “earned” over the years. As far as they are concerned, relics are fakes that are pretending to be something they’re not. Why not just get a new guitar and play the living heck out of it? That sounds good, but modern guitars are rarely painted with lacquer anymore. Most new guitar finishes are a heavy coat of polyurethane. Short of a hammer and chisel, you aren’t going to get nicks or scratches into that kind of finish, and if you do, it will just come off in ugly flakes, producing the very sad “bad relic.” Polyurethane also doesn’t check into the beautiful delicate patterns that lacquer does. There’s a Japanese concept called “Wabi-Sabi”- the aesthetic that values imperfection, incompleteness, and a little roughness around the edges. While there’s something lovely about a brand-new perfect guitar that looks like it’s been dipped in plastic, the guitar that looks and feels like an old friend has its own loveliness. The metaphor that gets thrown around a lot for reliced guitars is that of blue jeans. Sure, you can buy a stiff pair of brand new jeans and wear them for years to get them broken in, but you can also buy prewashed distressed jeans with wear and fading and even holes in them. I say get what you want, play what you want! It’s an open secret that many touring musicians don’t take their precious vintage instruments on tour with them, but rather relics they’ve had made as stand-ins. If you think you’ve seen Slash on stage with his $250,000 1959 Les Paul, I have news for you. If I want to play a guitar that looks and feels like my grandaddy left it in the barn behind the John Deere for fifty years, well, that’s just what I should do. The guitar plays like butter (guitar people always say that- honestly I don’t know what butter would play like), looks great, and sounds fantastic. I can’t think of anything else I could want. All About My Creston Guitar! Since I’ve had the guitar (March 2014), I’ve removed the tremolo (a highly modified Bigsby type). Other than that, though, I haven’t changed a thing: and I’m a notorious guitar-thing-changer. Collaborating with a custom builder is a remarkable experience that few players get. Lea is a delight to work with: articulate, patient, but not afraid to declare a strong opinion. His FAQ might paint him as a little more of a curmudgeon than he is in practice. The conversation started with wood (what he had, what different varieties might sound like), then went to body shape, neck profile, and, finally, electronics. We settled on, respectively, salvaged spruce, telecaster, almost baseball bat, and Lollar gold foils. Lea was constantly in touch, sending photos, queries, updates, and videos. One day I got a video from him showing him pressing the neck into the pocket and then using it to lift the entire guitar sans screws, using the friction from the tight joint alone to keep it together. The price was reasonable: less than even the cheapest Fender Custom Shop model. Everything is impeccable from the carving on the nut to the NOS burgundy volume and tone knobs. There are ways in which owning this guitar violates my fickle nature; every couple of months I pull out a strat or tele and try to convince myself that THIS is the change I want. I fall for the crystal position 2 and 4 sounds on the strat or the growl of the tele bridge pickup. But then there’s always something not right: the nut binds, or the neck is too flat, or the crystalline sounds that sound great in the basement don’t quite cut through a band (or a cocktail crowd) at a gig. Like all great tools, the Creston feels solid in my hands. It never delivers less than I put into it.